Ice on the Rocks - Ghumakkar - Inspiring travel experiences. It was a crisp, fresh morning, sun rays making their way into dark waters of Dal lake. The landmark ‘Shankaracharya Hill’ was just in front of us. All covered in green trees, the winding road that takes us to the top was covered in minutes by the bus. And then a steady, short climb of 100 odd steps takes you to the smallish still impressive stone temple of Shiv. Adi Shankaracharya had visited this place back in 9’th century and meditated over here. The stone temple by itself is typical Nagar style. 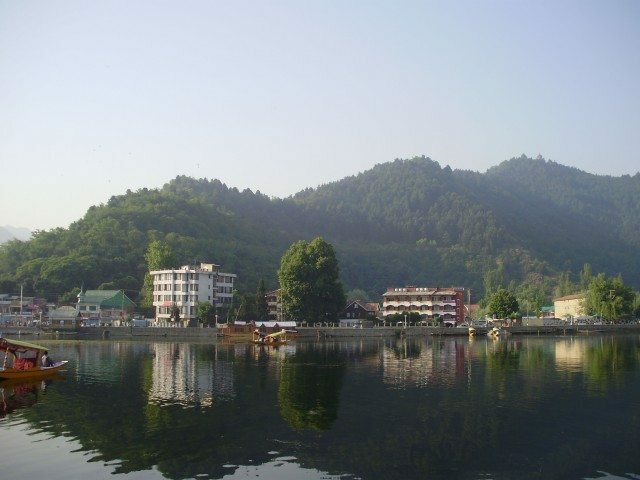 It was a moment of solace as we looked around and below taking in lake studded beauty of Srinagar, and sat beneath the century old trees, their leaves swaying in light breeze and chants of ‘Shiv–stuti’ being recited in the temple, formed waves of purity and peace. And how we relished that moment, particularly after being amply annoyed by a very ‘commerce centric’ treatment given to us by Kashmiri boatmen, shikara owners, saffron sellers and shawl shop owners. And then the journey started, to Leh and beyond, to the cross roads of silk route, the blue shores of Pangong and to the barren stark valleys and a way of life so distant and so different from the rest of India. The morning progressed fast through valleys of green grass, mountains with snow caps, clear blue sky and golden sunshine. The beautiful vale of Kashmir enfolded in front of our eyes as we followed NH1D. The green foam of gushing Sind River gave us company as we went past Sonmarg and started the steep climb of Zoji La. The scenery was outstanding. The sliding slabs of snow melting directly into flowing river, tall trees of Devdar standing erect on the bright green slopes of hills, small poodles of turquoise water arrested by ice and the dangerous, strenuous journey! Each turn taking us higher, the road almost nonexistent at times, looking down from window the beautiful valley and the hairpin bends of the road visible, Zoji la definitely scares you. 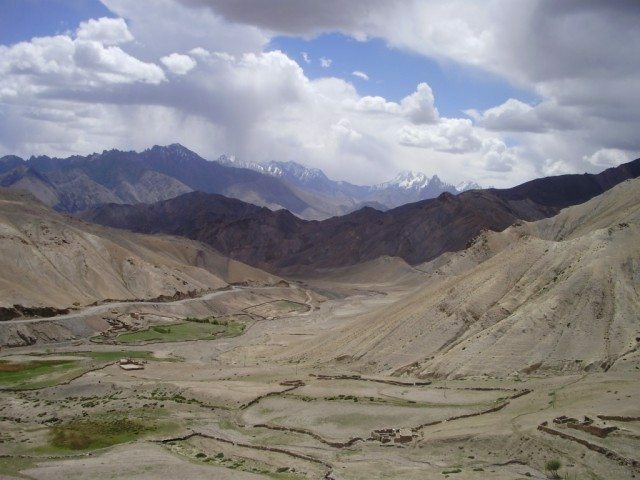 This pass separates the green and blue valley of Kashmir from the brown and gray Ladakh region. 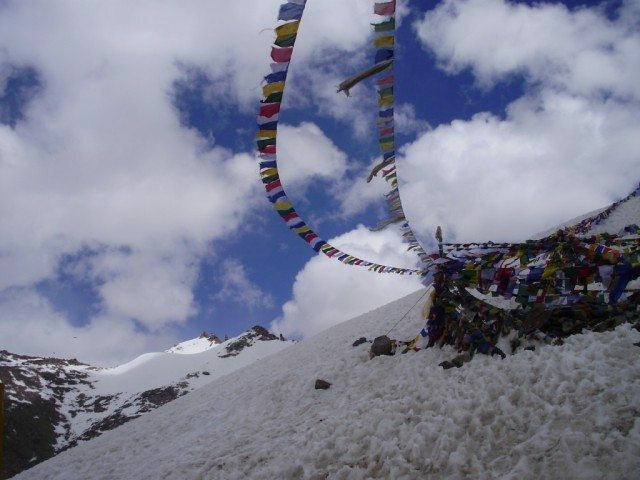 Standing at 11578 feet, although not one of the highest passes in India, this one is most important and commands fear for sure. Zoji la is closed for 6 months because of snow and Ladakh gets cut off from Kashmir . After saluting the spirit of Indian Army at Drass memorial, we moved towards Kargil. The landscape now changed significantly. Hills and valleys of stones and boulders accompanied us, with a background music of roaring Suru river, wondering about some lone bush bloomed with pink flowers, the road lunged ahead. Kargil is a town perched on the bank of Suru river. Although our current memory associates Kargil with the Indo-Pak war of 1999, this place has been an important trade transit town in the past. 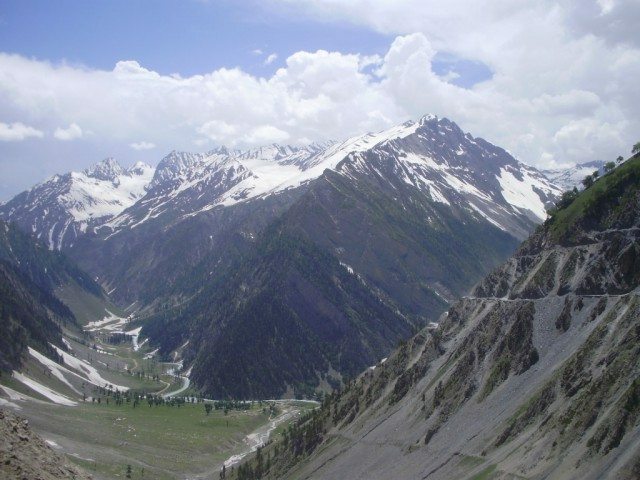 Kargil is located at a strategic point as it is the gateway to Baltistan. Road coming from silk route through Gilgit, Baltistan would pass from here towards the Kashmir valley and then rest of India. 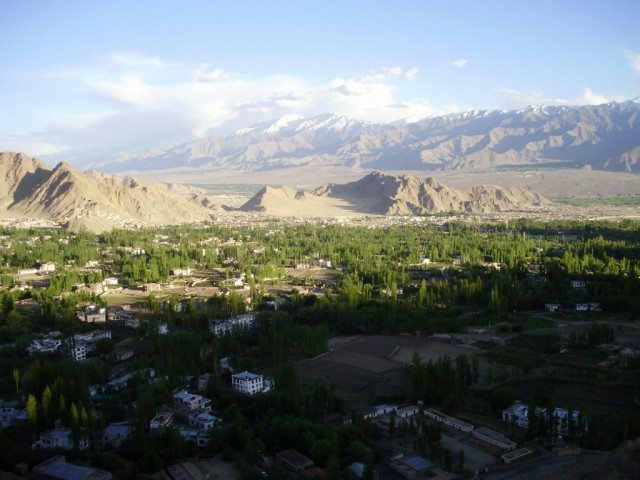 This northernmost town in Indian territory was a place for caravans to rest, rejuvenate and move ahead.. Capturing Kargil will create a rift between Kashmir and Ladakh region. This town is now just a place on the NH1D where people take a stop between Srinagar and Leh. And yes, it does invoke the memories of war recently fought at Drass. The next morning, leaving the Kargil behind, we started towards Leh. Kargil, officially is part of Ladakh region. Although geographically similar, culturally they are far apart. Kargil region is Islamic and Ladakh is predominantly Buddhist. The people of Kargil are Dards and Balti. Dard reminded me of ancient tribe of Darad located in the same area. The gateway of Budhist Ladakh is at Mulbek where we see a huge statue of Maitreya Buddha carved in stone. The statue is impressive. A small enclosure is built for praying stopper byes. And also present is the huge prayer wheel decked in golden, green and red colors. Buddhism assumes existence of 6 more Buddha’s apart from the Gautam Buddha. Maitreya is the future Budhha i.e the one who is yet to come on this earth. There are also 5 ‘Dhyani Buddha’s and 5 Bodhisatva. Now Bodhisatva is a concept which implies someone who helps others attain the Nirvana and has the potential to become a Buddha. There are also 5 Consorts assumed for these Bodhisatva’s., the generic name being Tara. Buddhism has 3 primary branches, Sthavirvad, Mahayan and Vajrayan. It is Mahayan and Vajrayan who believe in these gods and goddesses and related mythological tales. Vajrayan also goes further and adds secretive ceremonies and even more mythology. One can easily draw similarities in Hinduism in terms of Avatar concept ( Vishnu and Buddha), mythology, collection of gods and goddesses and also some practices in Shakta-Shaiva sects. Doctrine of Buddhism relies heavily on attaining the balance in day to day life and finding your own way ‘ Atma Deepo Bhav’. However in practicing Buddhism, several symbols and rituals have crept in which are followed by the devotees. The prayer wheels are also one such concept. Every turn of that wheel implies a chant of mantra written on that wheel. The same is true when prayer cloths are tied at high passes. Every swing of that cloth means a chant of the mantra. So we also moved the ‘Dharma’ with whatever our capacity and then moved ourselves towards Leh. And then we saw her! The muddy brown waters of Sindhu – the Indus flowing in opposite direction. As we stepped down to appreciate the magnificent confluence of Indus and Zansker, it touched my heart, that I am on the banks of Sindhu, so gloriously described in Rigved and many other literatures. The River responsible for coining the word ‘Hindu’ ! The ancient Persians would call the people living beyond this river by the name of the river, and since they pronounced ‘S’ as ‘H’, we are now Hindu. The mighty Indus, our ancestors lnowingly called her Sindhu which also means sea. 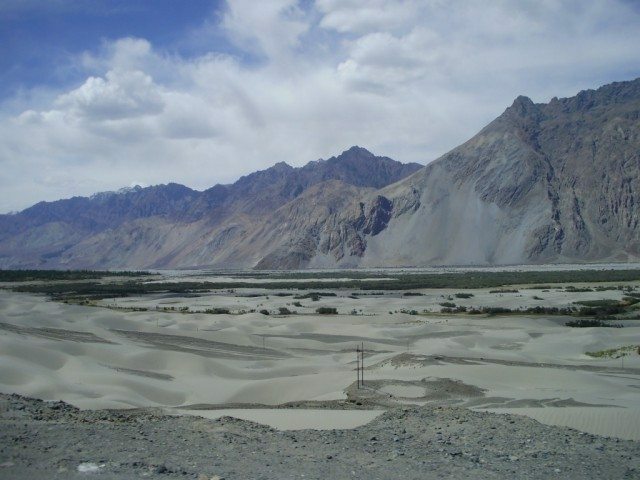 Here in Ladakh it is not as mighty as it would be in the plains, but it is still powerful. Dipping our toes in Sindhu, I could not but think, how quiet and lost it looks without the usual glamour of river goddess which we are so used to, be it traveling alongside Ganga or Yamuna. No stone ghats, no temples, no pilgrims, no flowers flowing and no aarati! Leh is a town now grown into a city thanks to tourists and wars, is squeezed between tall Ladakh ranges on the banks of Sindhu River. The landscape of this region is full of contrasts. Snow decked mountain tops at a distance are shielded by sand and boulder show of lesser mountains to be contrasted immediately by bright green patches of fields and houses accentuated by the omnipresent poplar tree trying to reach the sky. It is this ironic landscape that amazes you for your entire stay, ice with sand, green leaves with stark stones, side by side. 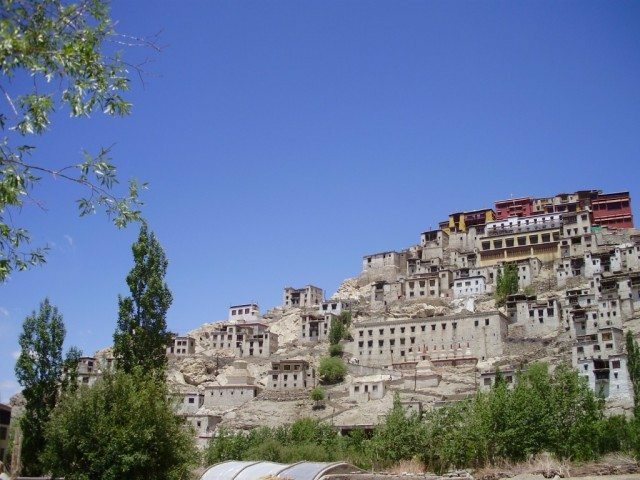 Ladakh region is home to several Buddhist monasteries such as Hemis, Thikse, Alchi etc. acclaimed for their structure, the paintings and more often the devotion of followers. Apart from monasteries, what catches your attention are the ‘chorten’, small stupa like structures built by people for fulfilling their wishes..
Leaving aside these religious outings, our next foray was into the Land of Nubra River. 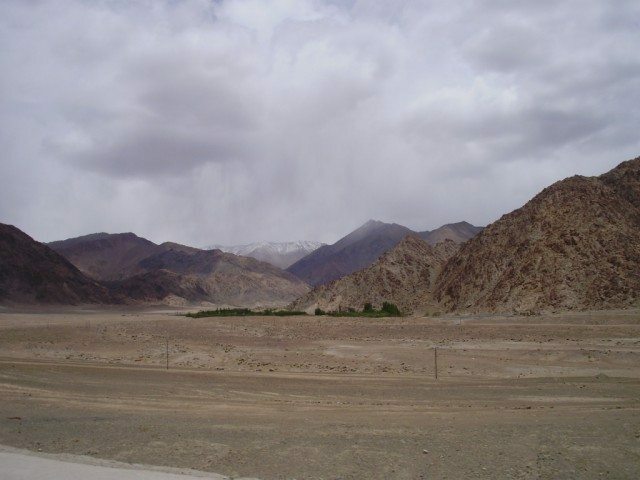 Ladakh as the name suggests is the land of passes. And we did cross some of the highest passes during this journey. Khardunga La ( la means pass) at 18380 feet commands respect. The rarefied weather, add to it bone chilling cold does not let you stay at the top for a long time. But it sure creates a lasting impression on your mind, with those snow white slopes all around and the strings and strings of colourful prayer cloths chanting their prayers to the heaven. The journey downhill was the most enchanting as we descended into the valley, the snow dispersed, the wide meadows appeared with yaks dotting the grazing ground, white and gray shades turned into green and brown, life emerged slowly..
Nubra and Shyok are tributaries of Sindhu, contributing from north. 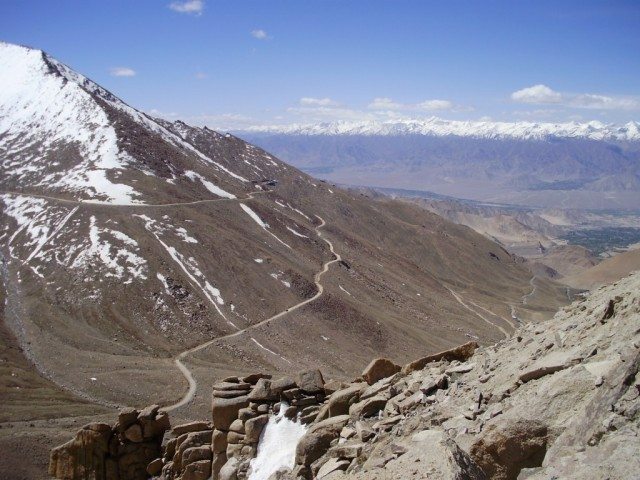 The silk route caravans coming from Yarkand in China would climb down the northern Karakoram ranges into Nubra valley and then move towards Kashmir crossing the Ladakh ranges. 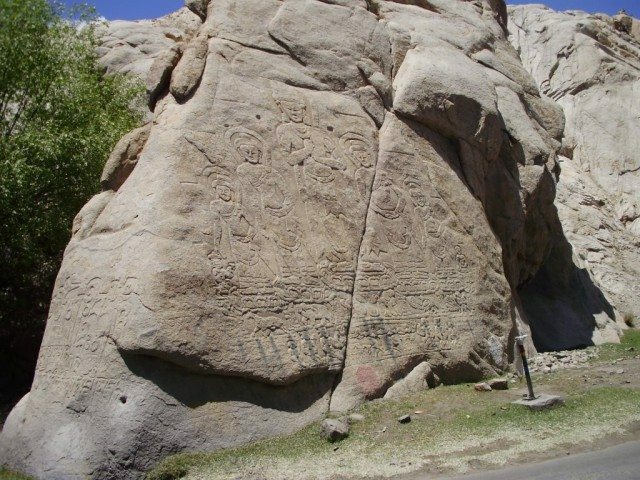 The same route was followed by several invaders from central Asia who wanted to control this valley. 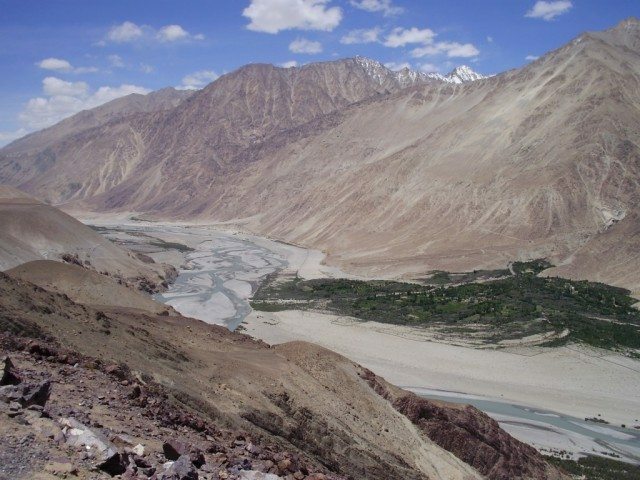 It is still a sensitive spot since the northern tip of this valley is occupied by Siachen glacier, one more conflict point between India and Pakistan. The age old travel route now closed for good post 1947, it is a thread of history lost, the memories fading away and life turning a new page. 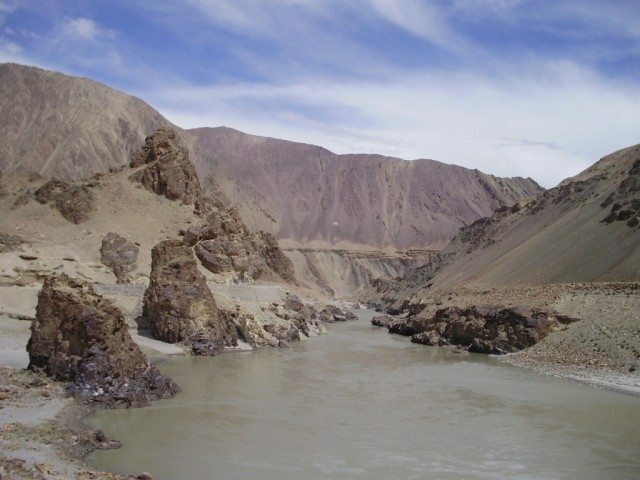 The long winding blue ribbon of Shyok river, carving its way through massive mountains, the emerald patches of township, the desert land , a reminiscent of the ages when Himalaya was a sea, the white sand dunes, the Bactrian camels, the scenic and serene surroundings, totally away from urban city life, it creates magic .. The small leafy settlements at Diskit, Hundar and other towns, nestled in the lap of valley, village roads lined with apricot and Poplar trees and wild rose blossoms, forming an archway on a running brook, in a far away corner of our land, it was almost a different world, different era probably. 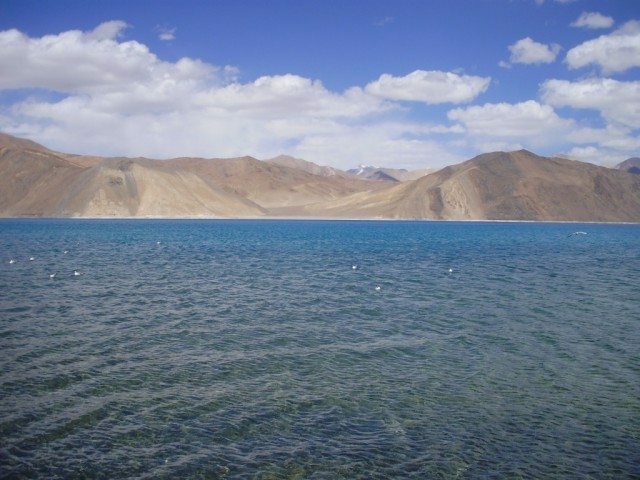 The last sojourn was to the Pangong lake. These high altitude salt water lakes are also one of the evidences of Himalaya being formed from a sea that vanished when landmasses collided. 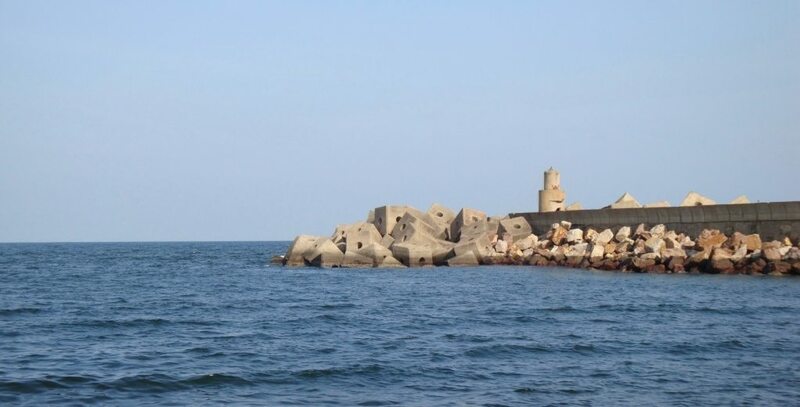 This lake has found much place in the pop culture now thanks to it’s role in ‘Three Idiots’. And yes the lake is a wonder by itself. The landscape is so alien and so amazing, you could forget yourself. The deep blue water horde, bound by buff mountains in shades of brown, gray and crimson, the road takes you alongside the lake, the white water birds flocking around, swimming and taking flight, the rising moon in clear blue sky makes the picture perfect. It is a place which is cold, remote and harsh but the beauty of the place is breath taking. We could spot a couple of tents and houses and we actually stayed in one of them applauding the grit of the people who stay in such extreme conditions for the year. Must say you have described all in details, seems like reading a best seller story. Just few questions as I am planning to take holidays in next two weeks. 1. Is it safe to drive yourself til Laddakh? 2. What shall be duration of this trip if some one wish to go by road ? 3. Is it safe to take parents who are 60 years plus ? As I have heared that there may be problem with breathing as Oxygen is less ? Keep up good work going. Leh Ladakh is always a treat to watch. 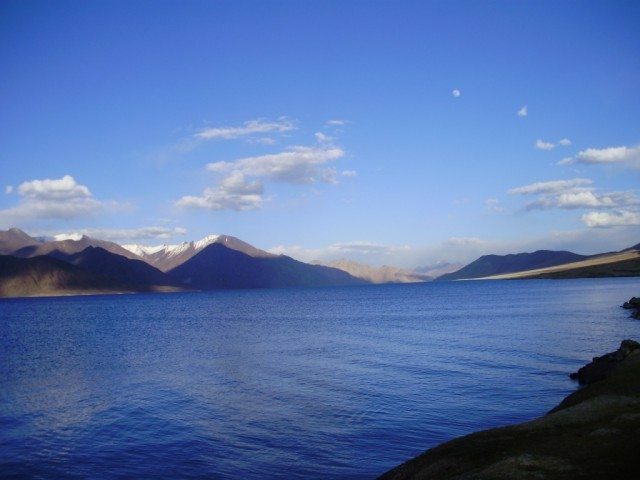 You have narrated beautifuly and the pic of Pangong lake is beautiful. The feeling after visting Khardungla and Changla Pass is great. ?? ?? ?????? ???? ?????? ??? ? ?????? ??? ??? ????? ??? ?, ???? ?? ?????? ?????? ??????? ???? ???? ???? ????? ??? ???? ???? ?????? ?? ???? ??????? ?? ??? ???? ?????? ???? ???? ??????? ????? ?? ??????? ??????? ?? ??? ?? ????? ?? ?? ??? ????? Beautiful blend of narration and pictures. A very well documented post. Manisha, Excellent post! 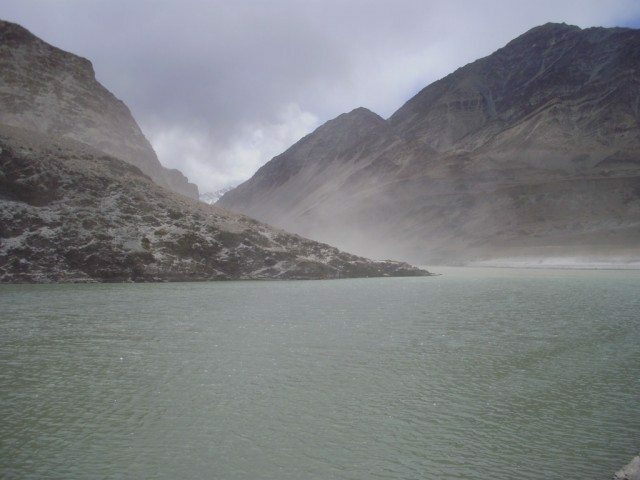 Makes me want to go visit Ladakh.. When are you publishing a book of all your travelogues? Wow! Wonderful one! Simply fell in luv with the place and the pictures are awesome! Great post!!! Thanks for reading and appreciating the post. Its nice to see your post after a long time , Once again a masterpiece from you !!!!! it was a real engrossing and educative description. Pics defy words. the article above would be envy of any travel writer. your pics are simply awesome…. thanks for sharing.. Yes Mahesh, It has been a along time for sure..
Vibha, not fair… dont u want Sindhu to have that ‘River Goddess’ look sometimes ? Joshi Kaka, nice to see your comments here. Very nicely written and awesome pictures. After enjoying the setting sun and jhaal muri on beach, we went to Kalimatha Temple which was decorated for Kali Puja on 28th i.e. Diwali for non-Bengalis. Then we went to the famous CMR shopping mall as my parents have never been to a shopping mall before. But it was a disappointment compared to the real shopping malls like those in Pune.